Neil Hegarty's Dufour 34 Shelduck arrives in St Lucia to complete the Transatlantic stage of the cruise which has been awarded the ICC's premier trophy, the Faulkner Cup, for 2014. #irishcruisingawards – As the recent Irish Sailing Association's Public Consultation meetings in Dun Laoghaire, Cork and Galway to discuss its new Strategic Plan 2015-2020 have shown, the cruising community may not be high profile, but there are many of them, and their behavioural patterns in going afloat, and ways and means of doing it, are as varied as their extraordinary range of boats. What is clearly emerging is that the cruising people expect Irish sailing's national authority to be able to guide them towards qualifying for the International Certificate of Competence, it also expects them to be able to negotiate the government into a more sensible and manageable system of boat registration, and it expects the ISA to be up to speed on the problems being faced about the lack of convenient fuel pumps for marine diesel, and the continuing confusion in the situation regarding which type of fuel is legally available for use on boats. But while those who cruise expect the ISA to provide a user-friendly administrative environment in which they can go about their various projects and pleasures afloat provided that they comply with statutory safety regulations, they do not seem to wish the ISA to be organisationally involved with what they actually do afloat. W M Nixon takes up the story. Racing, with its global structure of competition, its many internationally-recognised rules and regulations, and its basic requirements of competence by event management teams, is an obvious area of interest for the Irish Sailing Association through supportive action and, where required, direct involvement. 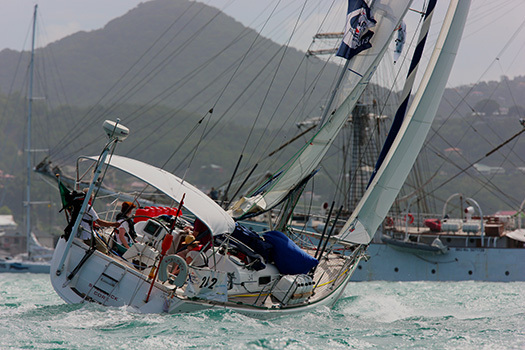 But cruising......well, for the racing obsessives who garner the bulk of sailing's attention and publicity despite probably being the minority of those who go afloat, cruising is usually seen simply as "not racing". It is essentially a private venture usually involving just one boat and her crew. And even where experienced crews have committed themselves to taking part in a more formalized Cruise-in-Company run by some group or club, they expect significant segments of down-time where each boat or small groups of buddy boats can go off and do their own sweet thing in terms of itinerary and length of passage chosen. But for most cruising crews, the ideal cruise is carefully planned for just one boat, taking into account the time available and the capabilities of boat and crew, and making due allowance for the conditions prevailing in the cruising ground selected, while always realizing that the final word on what is or is not achieved will be ultimately dictated by the weather. On such cruises, while some arrangements may be made ahead, with crew changing at pre-ordained ports often a dominant factor, the underlying hope is that there will be a sense of freedom of movement as to specific ports and anchorages being visited. And far from expecting to cruise in a formalized group, the traditional cruising enthusiast will reckon that new friends met informally ashore or on other boats in newly-visited anchorages and harbours is all an essential part of the colourful mix of unplanned yet enjoyable experiences which makes up a good cruise for just one boat voyaging on her own. Then too, every so often the boat and her crew will have to deal with adverse weather conditions. Doing so successfully and competently is part of a truly satisfying cruise. And so is reaching some objective, whether it be a distant port or island, or some place which provides access to a desirable mountain top to meet the needs of those climbers who are drawn to the possibilities offered by a cruising boat's wide range of destination options. And then there are the cherished memories which only cruising can provide, while equally there are shoreside experiences which seem heightened when you've come off a boat to witness them. For instance, the famous swing of the mighty incense-filled Botafumeiro in the ancient cathedral at Santiago de Compostela in Galicia in northwest Spain is something wonderful to behold at any time, but when you happen upon it by lucky chance the day after you've sailed your boat out to Spain from Ireland, it becomes almost supernatural. As for experiences which are exclusive to cruising folk, you can only really sail in to Venice with the dawn on a cruising boat, the only way to see Bonifacio as Ulysses saw it is when cruising, only with a cruising boat can you coast along under the absurdly vertical and ridiculously high Fuglabjorgs – the bird cliffs – of the Faeroes, only when you've got there with a cruising boat can you really savour the unique sense of place at Village Bay in St Kilda, and only by arriving in a lone cruising boat can you grasp just what a very special place is to be found at Inishbofin. While the unique pleasures of cruising are available to anyone with the basic experience and ability combined with access to an appropriate boat whether owned or chartered, in the final analysis these are private pleasure, intensely personal in their meaning. And thus they're just about unmeasurable by any known system. So how on earth can any national authority which is inevitably training and racing oriented get a handle on what is going on in the world of Irish cruising? Well, you could try just counting the number of boats with a lid in each port which don't go racing, and simply conclude that they should be added to statistics as part of the Irish cruising fleet. You could go into more detail by research through questionnaires to marina berth or mooring holders. And you could extrapolate answers which might give some sort of statistical picture. But as the recent Sports Council report on the numbers supposedly taking part in all areas of watersports involving floating vehicles of some sort or other and based on figures supplied by each special interest organization might suggest, you could well end up with some rather fanciful totals. Thus last night's Annual General Meeting in Dun Laoghaire of the Irish Cruising Club was more than just a get-together of the organisation which has been at the heart of Irish cruising from its formation in 1929. For the ICC AGM is when Irish cruising is most closely analyzing itself. Since its formation, the club has become firmly established in its central role through publishing its unrivalled sailing directions for the entire coast of Ireland in two regularly up-dated volumes based on unrivalled local knowledge. But while the Sailing Directions are the public face of the ICC, there's a more private face which last night also went public with the presentation of the club's annual cruising awards. While cruising is indeed an ephemeral activity which can be difficult to measure and analyse in any meaningful way, cruising awards are specific trophies for the best cruise in some particular category. While they were viewed with suspicion in the early days of cruising, the fact is that the keeping of a seamanlike log has always been a central part of proper seafaring, and these days its translation into a manageable narrative, eligible for a cruising award, is regarded as an integral part of the sport (and here we use "sport" in that special Irish sense to describe an activity which is not necessarily directly competitive, but has a certain edge of fun to it, for in active cruising you're in competition with yourself). And of course a proper log also provides – or should provide - useful information for those who may be planning to visit the same cruising ground. But it's in the bigger picture that a well-prepared log is at its most useful, as it assists those trying to grasp just what Irish cruising is all about, and how it is developing. The superb collection of logs compiled by Honorary Editor Ed Wheeler in the Irish Cruising Club Annual 2014 is a fact-filled picture of Irish cruising as it is today, so perhaps it should be required reading for those members of the Board of the ISA who don't really get what cruising is all about. That said, there are those who would point out that if you don't "get" proper cruising after experiencing just a little bit of it, then you'll never get it, and there's little point in trying to grasp its multiple meanings. If that's the case, then please just accept that it is there, it's an important part of the Irish sailing scene, and those of us who cherish it simply wish to be left in peace to get on with it with a minimum of bureaucratic interference. But enough already of trying to set the scene. With 33 full logs of cruises in many areas with widely varying mileages, and in boats of all sizes from the 70ft schooner Spirit of Oysterhaven (Oliver Hart) down to the 24ft gaff cutter North Star cruised by Mick Delap of Valentia Island, the Irish Cruising Club Annual 2014 further augments its plethora of information and entertainment with eleven additional mini-logs, and Honorary Editor Ed Wheeler is to be congratulated on putting together such an eclectic collection in a way that makes sense and gives us an unrivalled overview of contemporary Irish cruising. Cruising partners. Neil Hegarty and Ann Kenny in the Caribbean during Shelduck's award-winning cruise. When they're not cruising his Dufour 34, they're cruising her Chance 37 Tam O'Shanter which is currently in the Baltic. FAULKNER CUP for best cruise in 2014. Neil Hegarty (Crosshaven) with Shelduck, a 2003 Dufour 34. Shelduck's eight month cruise started with an east-west Transatlantic crossing, and then continued through the Caribbean including Cuba and on in detail up the East Coast of America until, after transitting the cheerfully-named Dismal Swamp Canal, they laid up for the hurricane season in the Atlantic Yacht Basin just north of Cape Hatteras. While other crews were aboard occasionally, throughout the voyage Neil Hegarty (a retired architect who was formerly in the forefront of racing fleets) was crewed by Ann Kenny of Tralee, whose own boat, the Chance 37 Tam O'Shanter, is currently in the Baltic. So to balance the Atlantic experience, they then went on for three weeks of Baltic cruising in the perfect sailing weather which that great inland sea enjoyed for much of 2014. STRANGFORD CUP for alternative best cruise. Eddie Nicholson, who sails from Kinsale, has been cruising the American side of the Atlantic in considerable detail since 2008 with his 2007 Najad 440 Mollihawk's Shadow. The boat's name derives from the 70ft 1903-built schooner Mollihawk with which a relative, Commander Vernon Nicholson of Cork and his family, sailed across the Atlantic in 1948. Their intention had been to get to Australia, but in cruising the Caribbean en route they sailed in to the abandoned and deserted former Royal Navy port of English Harbour on Antigua. They'd barely settled in the anchorage when some guests from a nearby hotel found their way on board and asked to be taken for a sail. Thus was Nicholson Yacht Charters brought into being. Any Australian plan was soon abandoned, and Antigua as we know it today, the focus of Caribbean sailing and home to the RORC Caribbean 600, was showing its first signs of its new existence in the winter of 1947-48 thanks to the arrival of Mollihawk. Her near namesake has been spending recent summers in waters remote from the balmy delights of the Caribbean, as she has been up and around eastern Canada. In 2014 Eddie and his number one shipmate Pat Dorgan combined forces to bring the much-travelled boat home via Greenland where, on the West Coast, they got as far north as Illulisat which looks to be a perfectly charming spot, but it still contrived in mid-summer to have its entrance blocked by ice from time to time. In fact, this was a cruise to West Greenland which started in Newfoundland and concluded in Kinsale, and when you work out what all that means, then you're beginning to grasp the sheer diversity of contemporary Irish Cruising Club activity. THE ATLANTIC TROPHY is for the best cruise with an ocean passage of at least a thousand miles, and it goes to John Coyne of Galway for a nicely-balanced cruise with Lir, his 1990 van de Stadt 10.4m steel sloop. Lir's voyage took her from Galway Bay south to northwest Spain, then across to the Azores, then home to Ireland to sail 1,219 miles from Ponta Delgada to Inishbofin, which is Atlantic cruising at its very best. John Coyne's Lir sailing on her home waters of Galway Bay. In 2014 she sailed first to Northwest Spain, then to the Azores and thence to Inishbofin. THE ROCKABILL TROPHY is for exceptional seamanship or navigation, and adjudicator Arthur Baker very cleverly turned it into a sort of Lifetime Achievement Award for Norman Kean of Courtmacsherry, who is of course the ever-diligent Honorary Editor of the Irish Cruising Club Sailing Directions, and in 2014 he was to be found on board various members' boats in some distinctly obscure locations, pushing the envelope for tiny anchorages. THE FINGAL TROPHY goes to any log with a certain quirkiness which appeals to the judge, and for 2014 it is for Ian Stevenson and Frances McArthur's account of the early-season cruise of the 1994 Beneteau First 42s7 Raptor from Strangford Lough to northwest Spain for much port-hopping, then back across Biscay to cruise South Brittany in considerable detail, then home to Strangford – 2124 miles in all. THE WILD GOOSE CUP, presented by the late Wallace Clark whose writings on cruising were universally admired, is for a log of literary merit. Theoretically it could be won by a cruise of just a hundred miles, but for 2014 it is the stylishly recounted story of the 2800 miles sailed by the Tony Castro-designed CS 40 Hecuba from her home port of Cascais in Portugal down to the Canaries, thence to the Azores, then back to Portugal, which most deservedly sees John Duggan awarded the trophy. THE MARIE TROPHY - best cruise by a boat less than 30ft. The little 1894-built cutter Marie was the first boat to be awarded the Faulkner Cup in 1931, and this trophy celebrating her memory is a reminder that the ICC is for boats of all sizes. With his part-owned Moody 27 Mystic, Peter Fernie of Galway fits well within the upper size limit for this award, yet with a crew of very senior sailors he'd himself a fine old time cruising from GBSC at Rinville to Kinsale and back, visiting all the best ports and anchorages in between. THE GLENGARRIFF TROPHY is for the best cruise in Irish waters. Curiously enough, while there may have been boats which got round Ireland as part of other ventures, there was no specifically round Ireland cruise to be eligible for the ICC's Round Ireland Cup, which dates back to 1954. But the newer Glengarriff Trophy has a wider brief, and it goes to Brendan O'Callaghan of Kinsale for a cruise from Dun Laoghaire northabout to Rossaveal in Galway Bay in the Westerly Fumar 32 Katlin, with many of those unplanned yet hugely entertaining meetings along the way with other cruising boats, which is what true cruising is all about. THE PERRY GREER BOWL is for the best first log by a new member. They seldom get as good as this, as Justin McDonagh of Killarney's debut account of his family cruise with the 2010 alloy-built van de Stadt 12m sloop Selkie takes us from the Canaries to the Caribbean, thence to Maine via Bermuda, and finally to New York, a wonderful achievement by any standards. THE FORTNIGHT CUP is for the best cruise within 16 days. In 2010, 2011 and 2012, Fergus and Kay Quinlan of Kinvara with their own-built van de Stadt steel cutter Pylades were awarded the Faulkner Cup three years on the trot as their fascinating voyage around the world rolled on. But in 2014 they showed they could cut the mustard when time was limited. Pylades headed north from Galway Bay and by the time they returned they'd been to islands as various as Tory, Barra, Eriskay, Canna, Mull, Colonsay, and Inishturk. THE WYBRANTS CUP is for the best cruise in Scottsh waters, which may seem an odd trophy for an Irish club, but the ICC has a significant membership in the north, and the west of Scotland is their Southwest Ireland. For 2014 the Wybrants Cup goes to Matthew Wright who cruised the Sweden 38 Thor from Bangor far north along the Scottish mainland's west coast, but also found time for a detailed visit to Skye including the remarkable Loch Scavaig. The Irish Cruising Club has several other trophies for specific achievements, and one of the most poignant moments of 2014 came in December when the ICC's JOHN B KEARNEY CUP for services to sailing was posthumously awarded to the much-mourned Joe English. Last night, another trophy for special service and achievement went to Kieran Jameson of Howth, who received the DONEGAN MEMORIAL TROPHY for years of devotion to offshore sailing in a career which includes 15 consecutive Fastnet Races, nine consecutive Round Ireland Races, one Middle Sea Race, one Round Britain and Ireland Race, and one ARC. Northern ICC member and environmental activist Brian Black was also honoured with the WRIGHT SALVER for his remarkable series of voyages far north along the challenging East Coast of Greenland - he got to72N in 2014. Another special award which has found a new home is the ICC's FASTNET TROPHY, which is not necessarily presented every year, and is for exceptional international achievement in any maritime sphere. The latest recipients are Andrew Wilkes of Lymington in England and Maire Breathnath of Dungarvan. They've been Mr & Mrs Wilkes for some time now, but their achievements are such that they deserve to be recognised as two remarkable individuals whose extensive cruising in the 44ft steel-built gaff yawl Young Larry is simply astonishing, as it has included a complete circuit of North America which took them through the Northwest Passage some years ago when it was still a prodigious challenge. During 2014 they took the opportunity to cruise in detail to many of the places between west Greenland and eastern Canada which they'd had to hasten past before, and awarding the Fastnet Trophy to them is proper recognition of a level of dedication to cruising which few of us can even begin to imagine. Of course, not all ICC activity is to utterly rugged places, and one of 2014's more intriguing ventures was by Paddy Barry (no stranger to distant icy places himself) with his alloy-built former racer, the Frers 45 Ar Seachrain. He provided the mother-ship for a waterborne camino to Santiago de Compostella being made by the Kerry naomhog Niamh Gobnait, led by the legendary Danny Sheehy. This traditional 24ft craft has already been rowed round Ireland and up to Iona, and by the end of 2014's stage of the voyage to northest Spain, they'd got to Douarnenez in Brittany with the Biscay crossing in prospect for this summer. Altogether less serious but a date well worth celebrating was the 85th Anniversary of the foundation of the Irish Cruising Club at Glengarriff on the 13th July 1929. So Paddy McGlade of Cork organised an easygoing cruise in company for 35 boats in which the only totally rigid date was being in Glengarriff for July 13th, which was duly achieved. And prominent in the fleet was ICC member Oliver Hart's 70ft schooner Spirit of Oysterhaven. This is a boat which has to work for her living as a sail training vessel. But the ICC were able to take this comfortably in their stride, as the continuing steady sale of the voluntarily-produced Sailing Directions leaves the club with a modest financial surplus. In 2014, some of this was re-directed to provide eight bursaries so that young people could avail of Sail Training opportunities on Spirit of Oysterhaven during the Cruise-in-Company, an imaginative use of funds which worked very well indeed.